How to Handle the Big Quilts a Little Easier! A lot of quilters complain of fatigue and shoulder and neck pain when they sit down at their sewing machine to work on a quilt. Since I quilt for several hours every day, I have found that working in no more than 90 minute increments keeps me from having my chiropractor on retainer! After a maximum of 90 minutes, I get up and stretch, walk around a little and generally loosen up. Then I’m ready to get back to work. Four or five 90 minute segments works well for me as a regular work schedule. Once you have hoisted your heavy quilt to this table, it can’t fall off. The weight is supported by the table and all you have to worry about is the part that's in your lap! Another problem with quilting large quilts is that gravity always seems to be pulling your quilt down. 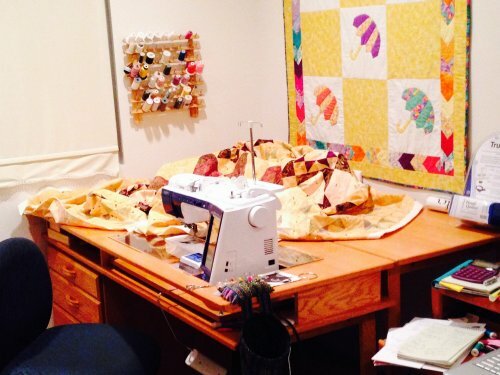 If you keep the quilt fluffed up as you feed it through your machine, you will not get the loss of control and the little bitty stitches caused when your quilt is “hung up” on your machine table or on a corner of the platform that fits on your machine (if you are not working on a flush surface). I demonstrated this technique on Simply Quilts in Episode 511 — I pull the quilt up from my lap, pile it on my chest and then sew down from there rather than trying to pull the quilt directly from my lap to the machine. Try it - your stitches will be more even. Are your stitches not as straight and even as you would like them to be — even when you are using a walking foot? Two things help make your stitches straight: a single whole throat plate for your machine and using the right needle. It's been my experience that a universal needle is too rounded to stitch perfectly straight; it merely finds the point of least resistance and stitches there. I find that a denim/jeans needle (I use a Schmetz Denim/Jeans, size 80/12) will punch right through needlepunched cotton batting so that my stitches are straight and even. Try it! When constructing a perfectly flat backing for my quilts, I always make sure that the lengthwise grain of my backing fabric is going up and down the length of my quilt. Crosswise construction may sometimes save fabric, but there is more stretch in the crosswise grain and the backing does not turn out quite as nice. I stitch my backing sections together with about a 3/8” seam (that's the width of my presser foot) and press the seam open for a nice, flat back. When it comes to batting for my quilts, I choose cotton batting all of the time. I love the “quilty” look that cotton batting gives to quilts after they are washed. There are several good brands available and you even have choices in color now that Warm & Natural and Quilters’ Dream Cotton have both come out with beautiful white batting. If you choose to use polyester batting, however, make sure that you are using a very low loft batting. Your quilt top tends to “float” on top of a high loft batting, no matter how well basted, and it's too easy to stitch puckers into your quilt. There are occasions when I want to pre-wash my cotton batting. If I am working on a contemporary quilt where I don’t want that old-fashioned “quilty” look, I'll wash the batting first. I will also pre-wash if all of the fabric for my quilt top and back have been pre-washed. I like everything to be shrinking at the same rate! To pre-wash a cotton batt (I have done this with both Warm & Natural and Quilter’s Dream Cotton with excellent results in my washer), I put the batting in my wash- er on the SOAK cycle and set the wash action to gentle and the water temperature to warm. You want as little agitation as possible here. After soaking the batt for about 15 minutes, I set the machine to spin. After spinning is complete, put the batt in the dryer with a couple of towels to absorb the moisture. This helps it dry a little more evenly so you don’t have to keep taking it out, rearranging it and putting it back in. Remember to buy extra batting if you intend to pre-wash as the batting shrinks by about 5%. Before basting your quilt top, it is important to get all the lumps, bumps, wrinkles and folds out of the batting. If I have time, I just lay the batting out overnight, but sometimes I don't have overnight to spare. In that case, I put the batting in a warm dryer (WITHOUT moisture; I don't want to shrink it unintentionally) and run the dryer for about 15 - 20 minutes. This will usually relax the batting and get rid of the wrinkles. Of course, if you have pre-washed your batting, the wrinkles will already be out! Basting your quilt is such an important step in making sure your finished quilt is flat without wrinkles or puckers on the front of the quilt or the back. The first thing to insure a flat quilt is to totally immobilize the back of the quilt before you lay the batting and quilt top on it. To do that, I use two 30” x 96” tables pushed together to give me a total basting surface of 60” by 96”. I secure the quilt back, wrong side up, to my tables by using office binder clips (there are also clips specifically made for this use available in quilt shops) all the way around the edges of the tables, making sure the quilt back is taut, but not stretched. To do this, you will need about 3 dozen 2” clips to secure the back about every 12”. If my quilt back- ing is smaller than the surface of my tables, I secure two or three edges (depending on the size of the quilt back) with the clips and the other edge(s) with masking tape. Basting with safety pins has become the accepted way to get your quilt ready for machine quilting. Thread basting is not strong enough to hold the layers together through the machine without shifting and the thread can also get caught on the toes of your presser foot, creating puckers in your work. I've been using the Kwik Klip for many years to help with my pin basting. I have one in my travel kit that I use when I do demonstrations and another at home for when I pin up a quilt. The one I use at home has all the printing worn off it because it's been used so much! One of the things we learn as kids is to hold tools in our dominant hands, so using the Kwik Klip was a little counterintuitive for me. I'm right handed and I hold the Kwik Klip tool in my left hand, leaving my right hand free to manipulate the pins. monofilament in the bobbin if either of these instances occur: 1) there is a multicolored print on the back of the quilt and I have not found a thread that I like with it; or 2) there is a high contrast between the back of the quilt and the front. If you have a dark front and a light back (or vice versa), it can be difficult to match threads and not have dots of one thread come through on the other side. In that case, I will use monofilament on the back and tighten the upper tension (move to a higher number) so that the clear comes through to the top rather than the top thread dotting to the back of the quilt. One of the key principles in machine quilting, or any quilting for that matter, is density. The density of the quilting must be even over the entire quilt for that quilt to hang well without ripples down the sides and what is sometimes called a “wavy bottom”. So, if the quilting in the interior of your quilt is fairly light and open, then you must choose an equally open pattern for your border quilting; if the interior of your quilt is heavily quilted (i.e., cross-hatched or stippled), then your border quilting must be equally heavy. It seems to me that the best way to assess density in a quilt is from the back, where the color and pattern aren’t a distraction. Before I decide I have finished with a quilt, I turn it to the back to see if there are any areas less quilted than the rest.They will “pooch” out as if to say, “Quilt me!”If those areas are then quilted, the finished quilt will always hang better. go back and stitch each individual block, either in the ditch or using free motion. When stitching sashings, make sure that you stitch both sides of the sashing in the same direction (I.e., top to bottom or left to right). If you stitch each side of a sashing in opposite directions, you get “fabric shear”, an unattractive diagonal pulling of the fabric. I like to use monofilament thread (I like Wonder brand by YLI) for all of my ditch stitching. Be careful to stitch a little slower when using it so that it will not stretch as you sew it into your quilt. You should also be stitching at a little slower (than piecing) speed when you are using your walking foot.It is called a “walking” foot, after all, not a “running” foot! straight pin from the previously stitched seam all the way back to under your presser foot. Insert these pins at about 1/2” intervals. This pinning will “ease” that potential pleating and you can stitch very slowly and carefully over the pins to eliminate that pleat. be on your merry way! Free motion stitching takes practice! There is nothing scary about it, it just takes the time to sit down and practice and “acquire the skill”. I have read in several places that it takes 20 to 25 hours to acquire a skill.That means that if you practice your free motion stitching an hour a day for 3 weeks or 1/2 hour per day for 6 weeks, you will become proficient. It’s putting in the practice until you find your rhythm.Once you find this rhythm (or “sweet spot”, as I call it), you won’t ever lose it. A few minutes of warm-up and you’re ready to go! tle curves. Forget it if you have your heart set on feathers! through the pad and through the channels of your stencil to leave a distinct, easily removable design on your fabric. When I use this, I mark one block at a time and then brush the chalk away after stitching. the top sheet and “needlepunch” the whole stack with an unthreaded machine. What a timesaver!